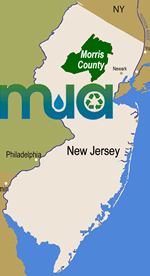 In Morris County, the municipal government decides how best to provide solid waste services to the town. As long as the municipal solid waste system conforms with the Morris County Solid Waste Management Plan, the town is free to provide collection and/or recycling depot drop-off services as it sees fit. Click on the municipality to bring up a Town Information Sheet. This will provide details on all the garbage, recycling, bulky waste, etc., collection programs available in that town. Contact names with addresses, phone numbers, etc., are also provided. Finally, a list of solid waste facilities, including municipal recycling depots located in the town is displayed. Just click on any of the facilities to view details on the services they provide. We try to keep this municipal database as accurate and current as possible but we suggest contacting the municipality directly with any additional questions. Contact us at info@MCMUA.com with any corrections.